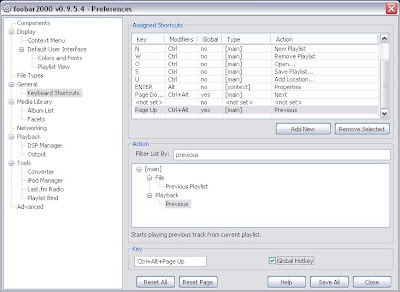 From Winamp to Foobar2000: Global Hotkeys! An awesome feature of Winamp is the global hotkeys (shortcuts that work even if you are focused on another application). It is more than easy to set them up in Foobar2000! Go to the preferences (Menu>File>Preferences), then to the section General/Keyboard shortcuts. We didn't even have to install any component. Foobar2000 rules!